·A Memorandum of Cooperation (MOC) with the Ramsar Secretariat: The Ramsar Convention, named for its signing in the city of Ramsar, Iran, is The Convention on Wetlands of International Importance. Stetson is the only law school in the world to have an MOC with the Secretariat, and Stetson students have contributed to the work of Ramsar’s Scientific and Technical Review Panel. ·International Wildlife Law Conference (IWLC): Stetson co-hosts the International Wildlife Law Conference, most recently held in Cameroon in December 2012, and next held at Stetson in April 2014. The 2014 Conference will include a session on sea turtle protection. ·Stetson International Environmental Moot Court Competition: Stetson’s International Environmental Moot Court Competition is the world’s largest moot court competition devoted exclusively to global environmental issues. Students compete in qualifying regional moots from countries as diverse as Australia and Zimbabwe. This year’s moot involves arguments on sea turtle harvesting and sea turtle egg collection. ·Journal of International Wildlife Law and Policy: Stetson acts as the law school host for this academic journal published by Taylor and Francis. This journal routinely publishes leading research on international environmental law. ·Other Programs and Research Study: Stetson frequently holds guest lectures in areas such as ocean and coastal law. Of particular note is the Foreman Biodiversity Lecture Series that often focuses on marine issues such as sea turtle conservation. Professor Royal Gardner serves as the director of the Institute for Biodiversity Law and Policy. 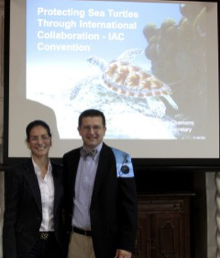 He is attending the Conference as an observer and will be representing Stetson University and its proposal to host the Sea Turtle Secretariat, a central office and program-generating center for the Inter-American Sea Turtle Countries. Professor Gardner is pictured above with the IAC’s Secretariat Pro Tempore Veronica Cáceres at Stetson during a recent visit. Professor Gardner is a past chair of the U.S. National Ramsar Committee and current chair of the Ramsar Scientific and Technical Review Panel; he brings extensive expertise in environmental and international law to this Galapagos conference. As a slight side note, recently two Stetson University College of Law students, working under Professor Gardner, prepared an amicus brief for the Supreme Court Case of Koontz v. St. Johns River Water Management District. Their brief offered information on the importance of “no net loss.” This groundbreaking case addresses complex wetland conservation issues and could result in rippling changes across our country.